With your certificate in hand, create the non-prod Kubernetes cluster. 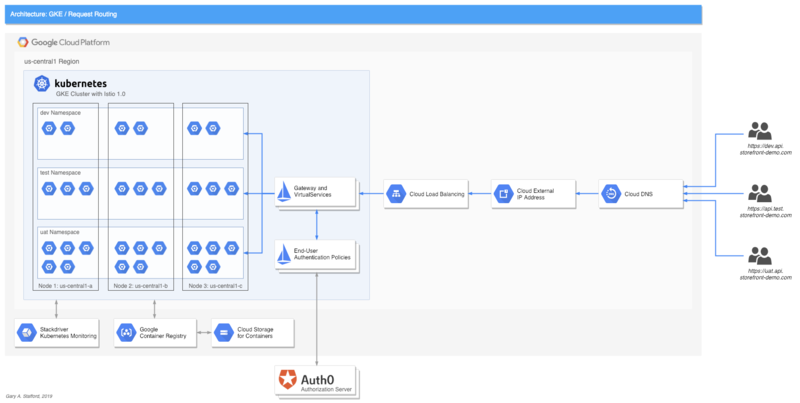 Below, the script creates a minimally-sized, three-node, multi-zone GKE cluster, running on GCP, with Kubernetes Engine cluster version 1.11.5-gke.5 and Istio on GKE version 1.0.3-gke.0. I have enabled the master authorized networks option to secure my GKE cluster master endpoint. For the demo, you can add your own IP address CIDR on line 9 (i.e. 1.2.3.4/32), or remove lines 30–31 to remove the restriction (gist). Next, deploy the Istio and Kubernetes resources to the new GKE cluster. For the sake of brevity, we will deploy the same number of instances and the same version of each the three Storefront API services (Accounts, Orders, Fulfillment) to each of the three non-prod environments (dev, test, uat). In reality, you would have varying numbers of instances of each service, and each environment would contain progressive versions of each service, as part of the SDLC of each microservice(gist). Originally published at programmaticponderings.com on January 12, 2019.